Start the best quality cuts with the Maturmeat Meat maturation cabinets. These sleek and stylish units cut the dry-aging process in half while looking good enough to show off in your establishment every step of the way! For example, you can age your steak in as little as eleven days with one of five pre-set recipes, or create your own! And these units range from 60 kg all the way to a whopping 400 kg in meat capacity. All internal / external products that come into contact with food are made of non-porous stainless steel AI SI304. Made from the same stainless steel are the front doors of each unit. They also include dual-insulated glass panels. Arguably, the best feature is the ClimaTouch control system. With a 6 inch touchscreen display, that automatically monitors all processing stages, the ClimaTouch allows the user to have access to the system that controls the entire functionality of the unit. The Maturmeat uses a non-monoblock refrigeration system, which translates to an open concept, comprising of the condenser and compressor - necessary for any refrigeration unit. Stagionello also uses their Fumotic humidifying system that works in conjunction with a tank system to regulate humidity levels inside the chamber to help you easily monitor all these different levels. There are four built- in probes that come standard with each unit. The humidity probe, the ambient prove, the evaporator / defrost probe, and the condenser probe. Additionally, there's the pre-calibrated pH probe, designed to connect to a PLC and communicate data to the display and record and store for a later date. To protect your products and shelf life, each unit comes with a lock and key, as well as a number of alarms built in to protect your product. For a delicious ray of options, efficiency, and style, cure and age your meat products within Maturmeat maturation cabinet today! To cure and age your meats with the most efficiency and style, try the Maturmeat meat aging cabinet from Omcan! 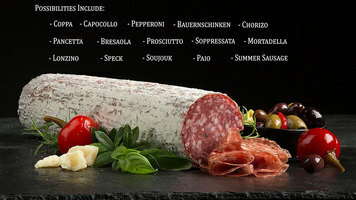 The Stagionello meat curing cabinet is designed with quality and ease-of-use in mind. It can create delicious, savory meats in as quick as 20 days! 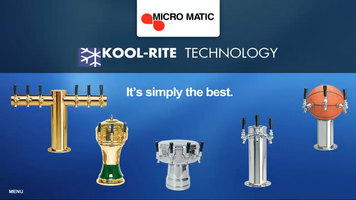 Watch this video to learn the mechanics behind Micro Matic's innovative Kool-Rite technology! It's the perfect way to ensure you beer comes out crisp and cold every time. 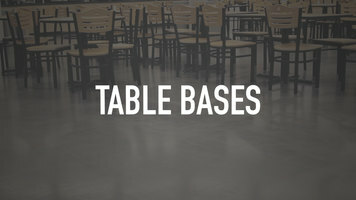 Looking for a table base for your restaurant or bar? Watch this video to learn about our wide selection! With varying styles, materials, colors, and features, you're sure to find the perfect table base for your establishment.